This electric ukulele is for sale along with a matching case. Our local luthier, Chip Bennett, has been building guitars and ukuleles in his spare time and is on the verge of becoming a full-time builder. 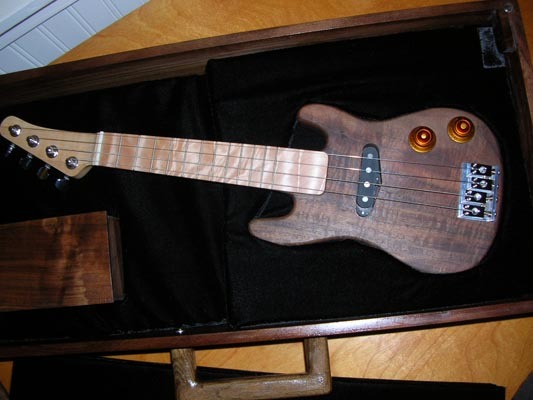 Late last year, Chip's teenage son requested that he make an all electric ukulele. When our West Hills Wood guys saw it, we had to have one. 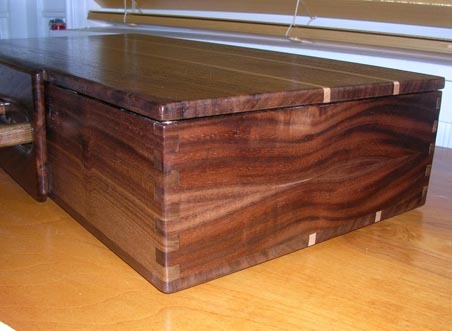 So we commissioned three and handed over a thick piece of walnut for use on the bodies. We had all along planned on keeping one and selling off the other two. But of course we had to add our twist to the game at hand and we came up with this terrific case. This electric ukulele and matching case will be sold as a pair only. You can skip to the bottom of the page for pricing/shipping details. The result was this stunning instrument. This is a soprano-sized ukulele measuring 20 inches in length. 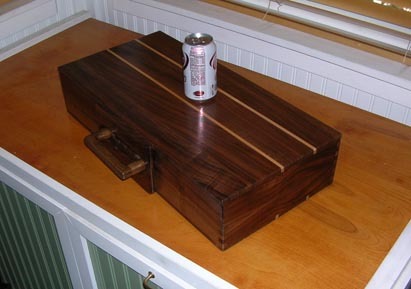 The body, as noted, is milled from a single solid piece of California black walnut. 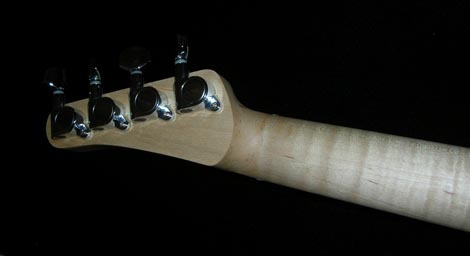 The neck is of curly maple. Once we saw and played the ukulele, we knew it deserved to have a case worthy of presentation. So we came up with some more walnut, glued in a couple of maple strips to help set off the brown coloring, and here we are. We put a soda can in this first image to give you an idea of scale. ...the bottom of the case. We put clear rubber pads on the corners for support and to keep from scratching things up. We held off on using hardware when building the case. The top slides over the case and here you can see how the wood handle also serves to keep the lid closed. Rare earth magnets on the case corners help keep the case together. 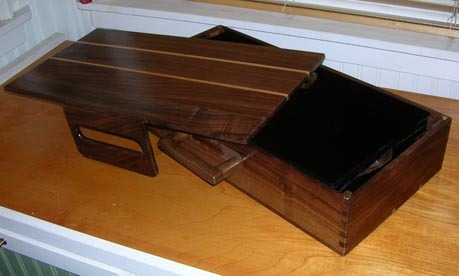 Our case corners are all tightly finger jointed for strength. The wood grain figure is evident in this side view. Of course the other side is slightly different in appearance. Case opening is accomplished via a sliding top. Simply slip the top clear of the handle and lift away. 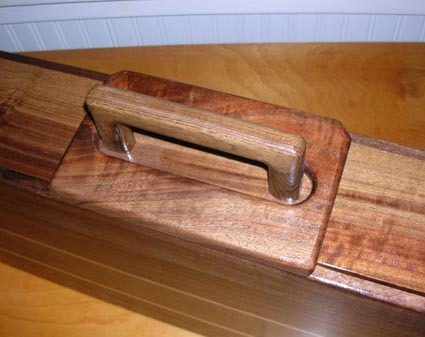 Solid wood catches are in place at the top edge corners in case the magnets loose grip. Once the top is removed, there is a padded, velvet covered piece over the electric ukulele. Lift and separate to expose the treasure. 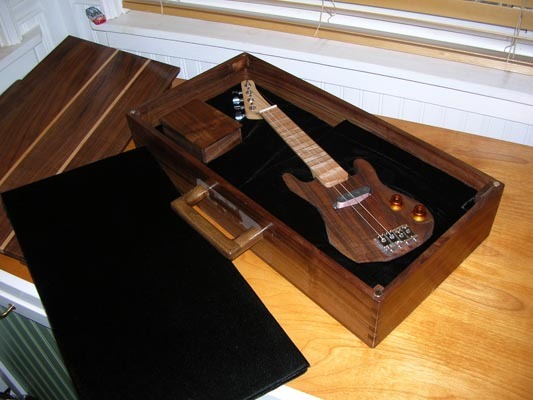 Here is the electric ukulele for sale, along with the matching case. Again, the instrument measures 20 inches in length, the body's widest point is six and one half inches. Volume and tone controls are logically integrated. The hand-wound pickups and steel strings are tuned to the classic ukulele GCEA allowing the sound to come alive. There is a small box inside the case for holding picks or a short chord. You can see the wonderful machine work and skillful matching of parts in this back view. 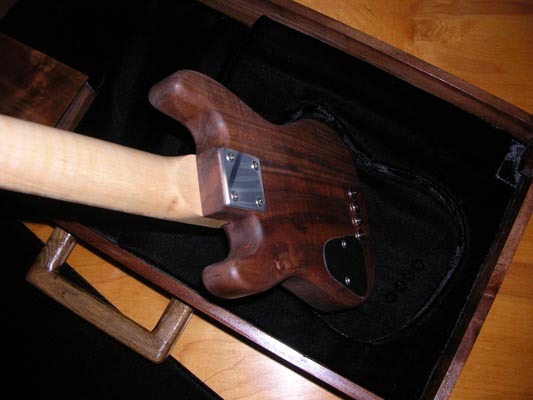 The walnut body has drama all its own. A curly maple neck and headstock highlight this instruments beauty. Closed gear tuners will provide years of trouble-free use. Here's one more look at the Chiptone electric ukulele for sale. 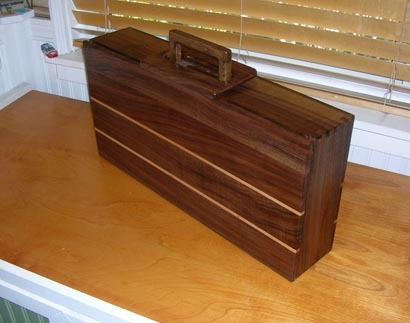 The matching walnut case was made at the West Hills Wood shop in California. The two will only be sold as a pair. Case dimensions: 11.5H x 23W x 5D, 12 pounds w/ukulele. price: $520, including UPS shipping to any US48. We have a second one of these sets available. It is only slightly different from the one shown. We have chosen to show only this one to avoid confusion between the two. 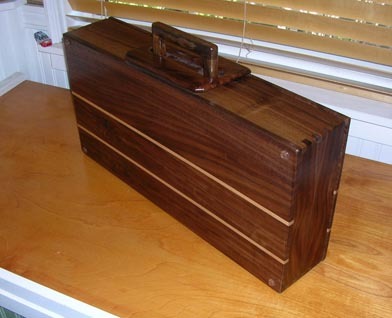 If you are interested in both ukuleles and cases, contact us and I am certain we can come to an agreement.